I was browsing through BHG and found this adorable family tree. 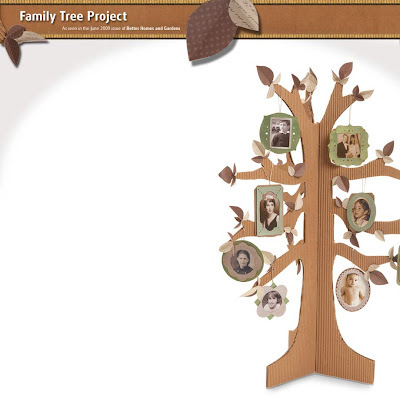 What a fun project to do with your kids and a great way to take an opportunity to tell them about their ancestors. This isn't the best picture but I wanted you to get an idea of what it looks like. I've included instructions and a link to the templates. My kids are too little for this one but I'm definitely saving this idea for the future. Enlarge the tree template as needed and cut out. using the craft knife. Repeat two more times, to make three tree panels in total. smooth side of the corrugated cardboard and cut out with the craft knife. Glue the corrugated cardboard to the front and back of each cardboard tree panel. panels together to create a tripod effect, so that the tree stands on its own. Hold together with your hands for a few minutes until the glue begins to set. Print out the ornament templates and cut out. Trace around templates onto the shirting cardboard and cut out with craft knife. Use hole punches to make decorative dots, if desired. Paint the individual templates with acrylic paints and set aside to dry for about 10-15 minutes. Trim photos as needed for each frame and adhere the photo to the second layer of each ornament. Glue the top layer of the ornament onto the second layer. back of each ornament with a little dab of glue. Set aside to fully dry before hanging. out half-circle shapes) and glue to the tree branches. Peridot - paints can be combined for custom shades); Making Memories scrapbook paper. Very cute! I love that it stands up and is a tree not a flat surface. I love all the pictures hanging for the limbs. REALLY cute idea for a sharing time or class project. (MY son is too big now) - but my Primary Class would love that. Can't wait to make this adorable family tree! Thank you for sharing it. This is a great idea! I use this family tree template from Lucidchart and this has given me some great ideas on how I can transfer my information and depict it with such a great craft.